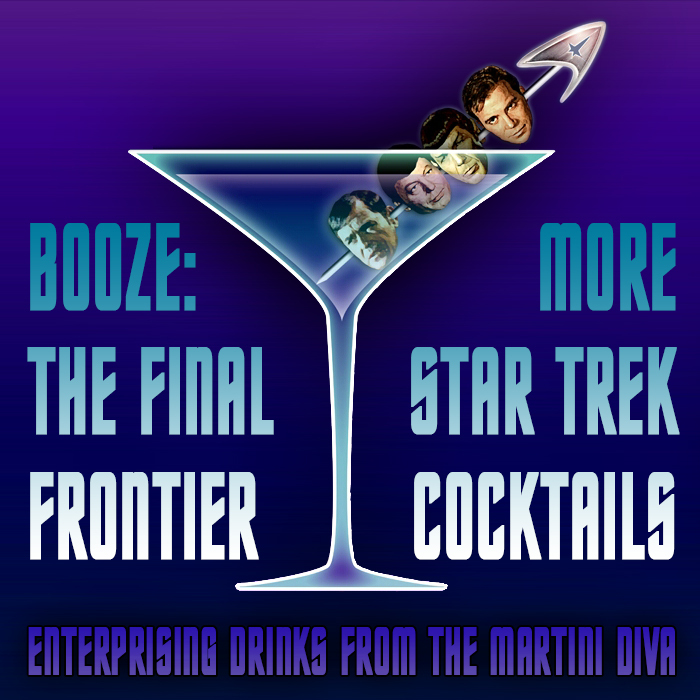 The MARTINI DIVA: STAR TREK INSPIRED COCKTAILS 2 - Booze! The Final Frontier! STAR TREK INSPIRED COCKTAILS 2 - Booze! The Final Frontier! To mark the occasion I am again posting up some fun Federation and Non-Federation Libations for my fellow Trekkies. Last year's Star Trek Cocktails were a blast to come up with and they were inspired mostly by the main characters of the Starship Enterprise. This year I was primarily inspired by all the alien booze that made it's way into the 23rd Century. Like last year, these are all my own personal concoctions, created to meet my own concepts of what these cosmic cocktails might actually taste like - with a little bit of garnishing humor thrown in. Chill a large wine glass in the freezer. Put the blackberries, powdered sugar and lime juice in the bottom of a cocktail shaker and muddle until nice and juicy. Add 1 cup of ice, pour in the wine and shake until well chilled. Strain into your chilled glass filled with ice, hang the black cherry gagh worm on the rim and ....enjoy? Chill a stemless martini glass in the freezer. Fill a cocktail shaker with ice, then pour in the rum, apricot brandy, triple sec, orange juice and pineapple juice and shake until chilled. Strain into your glass, add the grenadine and garnish with the star fruit slice. Add ice to a cocktail shaker then pour in the vodka, Blue Curacao, lime juice and triple sec and shake until chilled. Pour into a shot glass (shooter) then add the blue twizzler Andorian Antennae garnish. Add ingredients to a warmed brandy snifter. Stir gently. Beware. Color some water blue then freeze in large straws. Chill martini glass in the freezer. Add ice to a cocktail shaker then pour in the vodka, peach schnapps, blue curacao and orange juice and shake until chilled. Strain into your chilled martini glass then top off with the Sprite. Warm the frozen "warp coil" ice under warm water and drop into the martini as a chilling garnish. HAPPY ANNIVERSARY STAR TREK & TREKKIES (or Trekkers) and Enjoy!